It was a normal Thursday morning. I woke up to get ready for my strategy class and grabbed my phone to check the news. 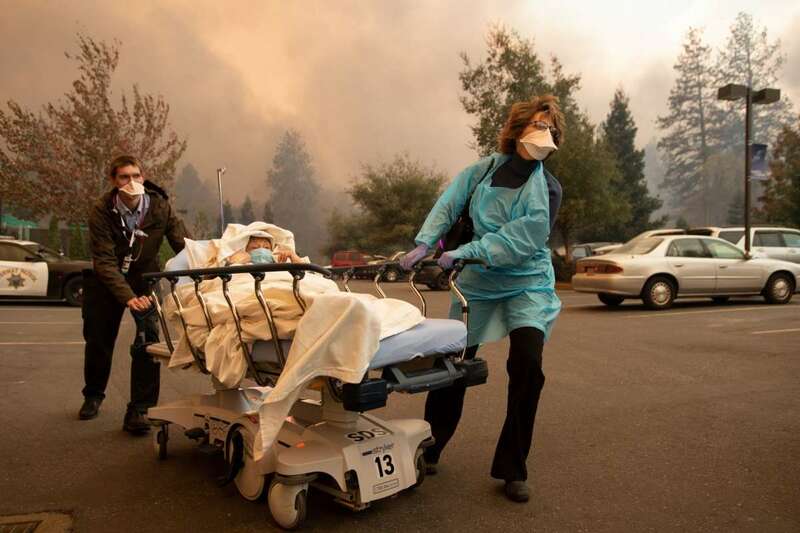 Instead I was met with a text from my mother, which read, “big fire headed our way, hospital evacuating and so are we…” Now, living in Northern California my whole life (aside from undergrad and my time spent abroad), I was no stranger to forest fires. 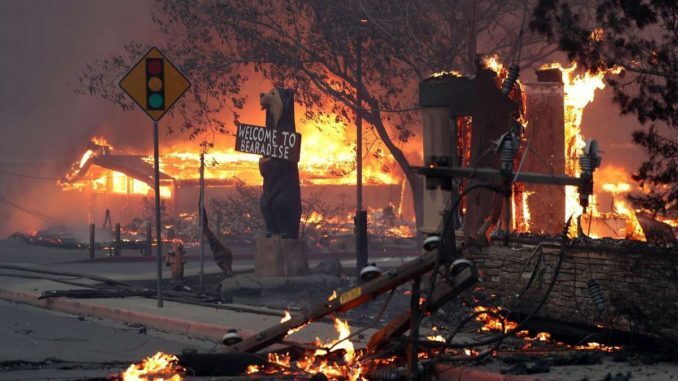 My parents have had to evacuate Paradise several times in the last 30ish years, and some years the fires had come pretty close to us. We always take it seriously, and years ago had made some “ready boxes” of photos albums that could easily be loaded into a car. That being said, I didn’t think much of this fire until I checked the Twitter account of my county’s fire department. This fire was going to be huge. I called home and was passed around between my dad, mom, and brother on speaker phone. My dad said the fire was getting very close, and they would be “rolling out” with the cats, photos, and guitars within 10 minutes. I had about two minutes to tell them what I wanted from my room. Looking back, there were so many things I wish I had said. The only things I could think of were my bag of souvenirs from my time in Europe, and my stuffed animal I had when I was a baby, Sweet Bunny. I think about those two minutes a lot. I was constantly texting my family updates, because internet and phone services were out. Pacific Gas and Electric (known as PG&E) had shut off the power to the town to try and avoid even more fires starting. But that also meant people couldn’t call 911. I have a special connection to the Feather River Hospital. I was born there, and shadowed doctors there for career education class in high school. Both of my parents put in a combined 40 years at that hospital. It was the largest employer in the town. It was also five minutes away from my house. Once it had become surrounded by flames, I knew things were not going to be all right. I was too stressed to go to class, understandably. I spent hours that day listening to the Butte Country police and fire radio channels on the internet. The desperation and panic in some of the emergency crews’ voices made my stomach drop. 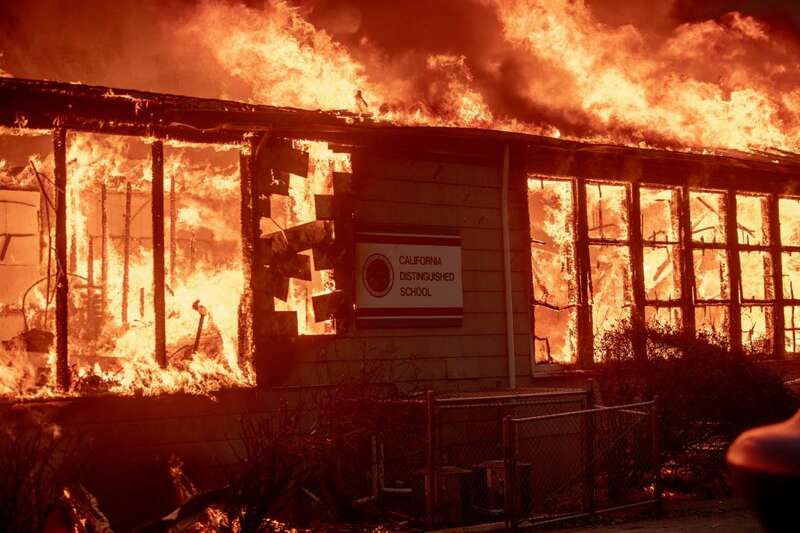 No one had ever experienced a wildfire like this. I never thought something like this could ever happen. Restaurants and stores I had been going to since I was born had become the last bastions of safety from the flames. The flames came rolling up the canyon from the Feather River. While staff were desperately trying to evacuate the hospital, dozens of people with burn wounds came flooding in to try and get treatment. It was chaos. The fire crews’ only job was to get people out alive, they didn’t have the time to protect peoples’ abandoned homes. Some even gave their lives fighting the fires. At one point, over 100 people were hunched together behind fire engines in the Walgreens parking lot on Bille Road. 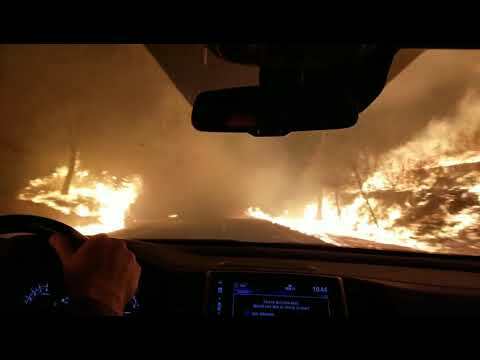 They had fled their cars because the fire came faster than they could drive. 26,000 people tried to leave the town at the same time, with two lane roads turning into a metal road block that lasted for miles. I remember hearing the radio calls as a fire truck was used as a battering ram to clear the roads. But it hit a particularly solid vehicle and the truck became another twisted wreckage. Hundreds were on the list of the missing at one point I believe it reached over 1,000 people. Twitter and Facebook were flooded with messages like, “My father lives at such-and-such address, he is in his 80s and is wheelchair bound. I am out of town and can’t get to him. He isn’t answering his cell phone. Could someone please get him out?” Honestly, I am amazed the death count wasn’t higher. My close friend’s dad runs a medical transport company. His fleet of vans spent 14 hours that day evacuating sick, elderly, and disabled Paradisians to the safety of nearby towns. They went into the thick of it multiple times that day. The videos uploaded to Youtube are something out of an apocalyptic movie. It is 1:30 in the afternoon and ash is raining down like snow, the sky is as black as charcoal, and the horizon is lit by orange wisps. Every time they leave the town and come back in, the fire has moved farther. The town was burned with such ferocity that people from literal war zones were called in. Perhaps my parents weren’t wrong in comparing it to Syria. They brought in teams that had previously been tasked with identifying the bodies of soldiers caught in explosions in the Middle East. Chico State University’s anthropology and archaeology departments helped sift through the ashes for bones that could be tested for DNA. As gruesome as it sounds, even a finger could bring much needed closure to families. It took days to put out the fire. Unlike most forest fires, the ash was too thick and the winds too strong for planes to dump fire retardant. The mountainous terrain made it difficult for fire crews to get defensible space. As of the most recent article I could find, from December 12, 86 people are confirmed dead and 11 are missing. 13,972 houses were destroyed. 4,821 other buildings burned. Over 240 square miles (620 km^2) were torched by the fire. Supposedly, one of PG&E’s power lines malfunctioned in that area roughly 30 minutes before the smoke was first seen in the town. California Governor and union lapdog Jerry Brown signed a bill into effect that allowed PG&E to raise the cost of gas and electricity in order to recover losses from lost lawsuits. 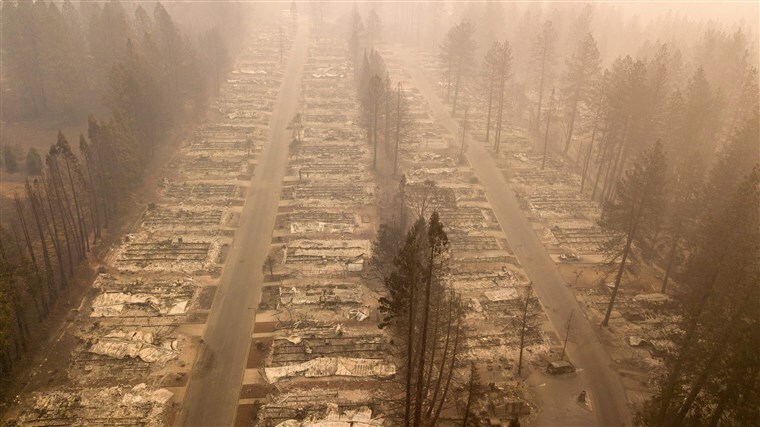 After the Camp Fire, PG&E called for a 9.5% increase in their costs. The outpouring of support was staggering. Companies like Birkenstock came and gave thousands of people free pairs of boots. Country-wide book collecting efforts donated over 10,000 books to victims of the fire. The Red Cross came and gave Visa gift cards with a couple hundred dollars, so people could feed their families or buy the necessary clothes they desperately needed. There was even support for the support. Television cooking star Guy Fieri prepared meals for the firefighters. Hollywood director Ron Howard teamed up with National Geographic and interviewed people. There is rumor that a major motion picture may be made from their stories. Churches, school groups, and people who just wanted to help came from miles away to prepare meals and bring clothing and toiletries. Even President Trump came out to inspect the damage. There was a saying in Paradise, “there’s a church on every corner.” Nearly all of the churches burned down. But the churches in nearby Chico, California (home of Sierra Nevada Brewery) welcomed their brothers and sisters with open arms, and services were packed with two-cities-worth of people. Paradise will recover. It will rebuild. But it will never be the same. As for me, I felt lifted up by my Thunderbird family. I am immensely thankful for the kind words, the hugs, and the prayers that were sent my way. It made it easier to persevere through the end of the semester, and I am not sure I could have done it without you guys. Gripping, touching, well crafted, your best work yet. Always finding new ways to amaze me.